Complementing the lens itself, the FUJIFILM XF 16-55mm f/2.8 R LM WR Lens with Circular Polarizer Filter Kit from B&H bundles the standard zoom with a 77mm circular polarizer filter. A flexible workhorse of a lens, the XF 16-55mm f/2.8 R LM WR from FUJIFILM is a versatile standard zoom spanning a 24-84mm equivalent, wide-angle to portrait-length range. Characterized by its bright f/2.8 constant maximum aperture, this lens is adept in difficult lighting conditions and also offers notable control over depth of field. Its optical design comprises both aspherical and extra-low dispersion elements, which help to reduce distortion and color fringing for improved sharpness and color accuracy throughout the zoom range. Nano-GI and HT-EBC coatings have also been applied to elements to minimize surface reflections and prevent lens flare and ghosting. Complementing the optical attributes is a Twin Linear Motor autofocus system, which offers impressively quick, quiet, and precise focusing that benefits both stills and video applications. Additionally, the lens has a fully weather-sealed design to support its use in trying environmental conditions. Standard zoom is designed for APS-C-format Fujifilm X-mount mirrorless cameras and offers a 24-84mm equivalent focal length range. Three extra-low dispersion elements are used to greatly reduce color fringing and chromatic aberrations in order to produce high clarity and color fidelity throughout the zoom range. Three aspherical elements control distortion and spherical aberrations, which helps to improve sharpness and realize more accurate rendering. A Twin Linear Motor autofocus system delivers smooth, near-silent performance that is especially beneficial to video applications and when working in noise-sensitive areas. The lens body incorporates extensive weather sealing to protect against dust and moisture, and to enable worry-free use in inclement conditions and freezing temperatures as low as 14°F. Rounded nine-blade diaphragm contribute to a pleasing out-of-focus quality to benefit the use of selective focus and shallow depth of field techniques. The 77mm NXT Plus Circular Polarizer Filter helps to reduce reflections and glare by filtering out light that has become polarized due to reflection from a non-metallic surface. The light from the sun naturally becomes partially polarized due to reflecting off electrons in air molecules, causing the light to scatter into what appears as haze. A polarizing filter arranges and filters this directionally polarized light perpendicularly to the reflected light, allowing for the absorption of much of this light. This results in a noticeable reduction of glare and reflections from non-metallic surfaces and an increase in the saturation of skies and foliage. Box Dimensions (LxWxH) 7.1 x 6.1 x 5.5"
XF 16-55mm f/2.8 R LM WR Lens with Circular Polarizer Filter Kit is rated 4.7 out of 5 by 109. Rated 4 out of 5 by Fredrick O. from Excellent general-purpose Fuji zoom I have the Fuji XF 18-55mm f/2.8-4 ('kit lens') but was tantalized by the 16-55mm f/2.8 lens' constant f/2.8 aperture (even at tele- end, for better portraits, & low light), weather-resistant build (like Fuji camera bodies), wider wide-angle range (35mm-eq of 24mm rather than 27mm, a small difference that is sometimes helpful), & 77mm filter size (convenient since I have a stash). Downsides: no image stabilization (hence 4 stars; but not essential) & heavier/bulkier lens (not terrible). The advantages, plus probably better image quality (still discovering after only a week), are already appreciated! Rated 4 out of 5 by tony from Extremely capable and flexible lens Love it. Despite the large size and high price tag, this lens could easily be the only one you'd need on a trip. I don't feel that the 16-55 replaces any primes that fall within the zoom focal length. They all serve a different purpose, particularly if you want to keep weight/size down. I think the 16-55 makes a good complimentary lens for owners of a 23, 35, or 50 primes. You can get the flexibility of a handy zoom range with the downside of weight, size, and cost or keep everything small by using a 23 or 35. Image quality is great. Very sharp at all apertures. I'm happy with this lens. With all that being said, it is large and pricey. Rated 5 out of 5 by Photoforlife from exceed expectations the 16-55 feels 100% pro; a very smooth and precise zoom and manual focus ring mounted. The friction in the aperture ring, which is labeled f2.8 to f22 and can be set at 1/3 stops, is just right. The lens focuses quickly and quietly, it's very well-built, tough where it needs to be, while the various rings turn smoothly. To me the new 16-55 is primarily for the pro/serious amateur landscape/architectural/wedding photographer, who is regularly shooting in harsh conditions (snow, rain, blowing sand) and who is after the best image quality. weaks: coloured fringing in corners at 16mm (but easily corrected in RAW). Softness in extreme corners at 16mm and 55mm between f2.8 and f4, but very good in center/middle. Rated 5 out of 5 by John Sims from Fuji XF 16-55mm f:2.8: One great lens I presently own the X-E2, X-T1, 14mm, 23mm, 18-55mm kit, 56mm, 55-200mm. As a former (Nikon-Leica) professional of 20 years and now retired, I have found all of my Fuji lenses to be delivering outstanding image quality. Equal to the best from Nikon and some as good as Leica. 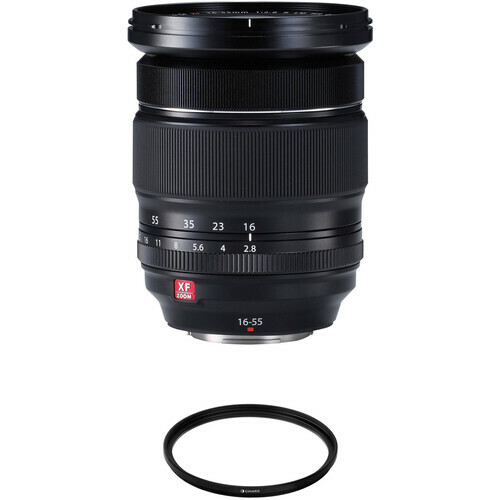 I just added the Fuji XF 16-55mm f:2.8 to my collection. Out of the box the lens is outstanding in sharpness, construction, and operation. My image quality looks as sharp as pictures taken with my 56mm f:1.2, which has been rated by some as one of the top 4 lenses on the market today. In very low light conditions I have pushed the ISO to 3,200 and at f:2.8, hand held at 1/40, and obtained outstanding results. This is a great lens for photographic artist. Rated 5 out of 5 by smh272 from (almost) As good as prime. If you're a typical prime-lens aficionado, or are zoom-averse, you might be blown away by the performance of this lens. Fuji pulled all the stops with this one, truly could be a prime lens replacement. There are several good professional reviews and you should read those if you want all the good details, so here's just a few of my own observations: The lens hood feels flimsy; the bokeh is good but not great; the focus is electronic, not mechanically linked; there is no internal stabilization. Bottom LIne: I'd say that this lens justifies it's price in the performance it gives. Rated 5 out of 5 by Thomas from Superb Lens! This lens just might be the ultimate Fujifilm lens. It's fast, constant f/2.8 maximum aperture and ideal wide angle to short telephoto range make it a lens that will stay on your camera a lot. Yes, it's larger than most Fujifilm lenses, and yes, it's heavier, too. But compared to my full frame DSLR kit with comparable lens, it's much smaller and lighter. I use this lens on a Fuji X-T1 body with the battery grip and it handles and balances very nicely. Feels like it was just made for this camera and grip. Optically, it's fantastic. Sharp wide open and throughout the zoom range. I was not sure I would really see much difference from the excellent 18-55mm kit lens, but really wanted the additional 2mm on the wide end so I purchased it. You will see a difference. The 16-55 is in a class of it's own. Rated 5 out of 5 by Levi from Great Mid-Range telephoto lens. It is a perfect mid range telephoto lens! covers all of ones needs, an absolute go to for most situations. Its weather sealed, fast, and to be honest not to big for the camera body. . . well balanced ( I do have the arca swiss grip on the XT-2 for a better grip). I have nothing bad to say about the lens. One thing I will point out is that since there is no image stabalization, if you are zoomed in all the way, and hand holding you are going to need higher SS especially because its on a cropped sensor compounding the shakyness. . . 1/80th (with steady hands) or higher for a sharp photo. Are Fuji X-mount lens compatible with Sony A6000 cameras? Are the aspheric lenses made of plastic? Does Fuji plan on having 2 classes of lens , for example, Canon have their L top of the line lens, and then secondary of non L lens? Maybe. They just released an expensive, weather sealed,16-55 zoom that is f2.8 throughout its range, that is sort of L like. Other Fujifilm lenses come with the lens hood, so does this come with a lens hood? I am interested, does this lens keep focus at the same point when I change the zoom ratio? embed should have read appeared . sorry. I was looking at this lens until I found out it doesn't have image stabilization. I've been using the 18-55 kit lens and am not really happy with the sharpness. I haven't read any of the reviews here that really complain about not having IS but then it looks like a lot of people use it with a tripod. I can't help but wonder how much of the 2.8 is given up by not having IS. Is there anyone here that uses this lens that consistently wishes it had IS? Hi Richard, sorry for late response...just saw this now. The 16-55 is definitely sharper than the 18-55, but it's also much larger and much heavier. And that's why there's not IS in it: the lens would have been too large. What you need to determine is what light level you're shooting at. Because the image noise is so well handled in the X series cameras, putting it at 800 or over is not an issue that should get you the shutter speed you need to minimize shake. I've been shooting with it for years and can't say I miss IS at all. Does this lens shade the flash on the X-T10? It does shade the built-in flash on an Xe-2, even with no lens shade in place, up to at least 35mm focal length. The flash on an Xt-10 may be just slightly higher, but I doubt that will help. Hopefully, an Xt-10 owner will comment. I'd suggest a good shoe-mount flash instead of the weak built-in one, anyway, which seem good for really close-range emergencies only---if you have one of the compact lenses, which this lens is not.